According to the National Sleep Foundation, an estimated 18 million adults suffer from sleep apnea. And many of them don’t know it. Obstructive sleep apnea occurs when the muscles in the back of your throat relax and collapse into your airway while you sleep, instead of keeping the airway open. With diagnosis and treatment you can manage this serious condition, and Dr. Arash Azarbal and our team can help you achieve a fuller, healthier night’s sleep. Sleep apnea is a serious medical condition where one’s breathing pauses/halts, sometimes as long as 10 seconds or more before restarting. This can be caused by a number of factors but most commonly is associated with the relaxation of the oral tissues while sleeping. It’s essential to address sleep apnea if you have it, as this disorder can have significant health consequences. Snoring, often quite loud, is one of the most recognizable signs of sleep apnea. However, not everyone who snores has this condition. Combined with other signs of sleep apnea—feeling sleepy and fatigued while you are awake, awakening suddenly at night, or waking up and gasping for air—snoring may indicate a more serious problem. Approximately 90% of people who snore have obstructive sleep apnea, which means their airway is physically obstructed during sleep. In addition to making you feel tired, long-term, untreated sleep apnea can be life-threatening. If you have this condition and it’s left untreated, you can have a higher risk for heart problems, cardiac arrest, and stroke. What Are the Risks for Sleep Apnea? Obstructive Sleep Apnea (OSA) – The most common form of sleep apnea, this condition occurs due to a blockage of the airway, often from the soft tissues covering or collapsing over the throat. Central Sleep Apnea (CSA) – This far less common type of sleep apnea happens as a result of the brain not sending out the normal signals to the muscles associated with breathing to function. In some cases, the brain is sending the signals correctly, but for another reason the muscles are not receiving them. Complex Sleep Apnea – The third type of sleep apnea is a combination of the other two types of sleep apnea, and is also known as Mixed Sleep Apnea. What Are the Sleep Apnea Treatments? A CPAP device—a machine that blows air into your nose through a mask—is the most commonly recommended treatment for moderate to severe sleep apnea. As effective as this therapy can be, many people find the device frustrating and uncomfortable. It’s important to find a mask with a good fit and appropriate style (full face, nose and mouth only, etc.) for your needs. That said, some people never get used to CPAP or BiPAP (bi-level positive airway pressure) devices, in which case a CPAP alternative may be the best solution. What Are the Alternatives to CPAP Machines? 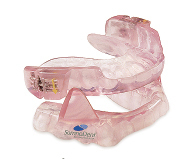 Use of an oral appliance to open the airway may resolve your sleep apnea episodes without the need for a CPAP device. If you have already been diagnosed with obstructive sleep apnea and are having difficulty using a CPAP machine, Dr. Azarbal can recommend a range of alternative treatments. Oral appliances are one example of a CPAP alternative that could help you address your symptoms and improve your health without the unwanted effects associated with a CPAP device. The American Academy of Sleep Medicine has designated oral appliances as the preferred treatment for mild and moderate sleep apnea and snoring. As an extensively trained dentist, Dr. Azarbal is experienced in the use of a number of non-invasive oral appliances, including Tap®, the Full Breath Solution, and the SomnoDent® MAS. Dr. Azarbal uses the Ares™ portable sleep study machine in conjunction with sleep studies recommended by your physician. Data gathered during a sleep study is used for diagnosis by a sleep doctor. The Ares machine is also used to ensure that your sleep apnea device is working properly, and to make any needed adjustments. Impressions of your teeth are taken to make a customized appliance to fit your mouth. It is worn while you sleep, so you can breathe without snoring and get restful sleep. Not everyone who has sleep apnea is overweight or obese, but excess weight can cause or worsen symptoms. Adjustments to your physical lifestyle and dietary habits can help you lose weight, which could reduce the size of anatomical blockages that contribute to sleep apnea. If you need help losing weight and traditional methods are ineffective, your primary care physician can provide alternative techniques that may be able to help. In severe cases, sleep apnea may call for oral surgery. Many techniques are available, and the type of procedure recommended will depend on the unique anatomical needs of the patient. Surgery is used to open up the airway, expand the soft palate, or reduce the size of tissues that block the airway. In children, removing the tonsils and/or adenoids can often alleviate symptoms of pediatric sleep apnea. To help you achieve the best sleep of your life, preserve your health, and maintain dental function, we have provided additional information. Dr. Azarbal has answered a number of frequently asked questions so you can become well-informed about sleep apnea and treatment options. Talk to our team today to find out more or to schedule a consultation. Some patients only experience minor concerns due to sleep apnea, but much more severe and life-threatening conditions can develop, including heart attack and stroke. If you have a reason to believe you or a loved one has sleep apnea, it’s important to discuss the symptoms with a doctor or dentist skilled in this area. What if I suspect someone in my family suffers from sleep apnea? One option you can suggest is to have the individual take a sleep apnea assessment test. These online questionnaires can help determine if an individual should see a specialist. Contact us today if you believe you or a family member or friend has this condition, as we can recommend a sleep specialist to confirm a diagnosis. This typically requires the patient to attend a “sleep study” in which they will be monitored during their sleep to identify signs of sleep apnea. Once diagnosed, we can help provide effective treatment options. Does snoring always indicate sleep apnea? Not everyone who snores has sleep apnea, and almost everyone will snore occasionally. That said, it’s one of the most common symptoms of the disorder. If you know someone who snores, or if you snore, it’s always best to get evaluated by a skilled professional to ensure nothing serious is occurring. Always better safe than sorry, we say! Who is at high risk for sleep apnea? Additionally, men and older individuals develop sleep apnea more often than women and younger individuals; however, it can occur in anyone. If you have a family history of the disorder, we recommend you mention this to your doctor when discussing sleep apnea. Drinking alcohol, smoking tobacco and marijuana, and gaining excess weight can exacerbate sleep apnea, making the condition more serious. Any lifestyle change you can make to limit the effects of sleep apnea are highly recommended, particularly giving up smoking but also sleeping on your side rather than your back. Certain medications may also worsen your symptoms, and it’s important to speak with your primary care physician about how any existing or new prescriptions might affect your sleep. What is considered severe sleep apnea? The rate at which you experience pauses in your breathing over the course of an hour determines the severity of your sleep apnea, a metric known as AHI—apnea-hypopnea index. Thirty or more pauses (called apneas; hypopneas are constricted breaths) per hour is considered severe. But as few as five apneas that lead to awakenings, whether you remember them or not, can cause fatigue and the sensation of chronic sleepiness. As a result of not getting enough oxygen, your heart must work harder to pump blood throughout your body. This increased strain on the cardiovascular system can lead to hypertension (high blood pressure), abnormal heartbeats, and even heart attacks. If you or someone you love is suffering with sleep apnea, contact our office to schedule an appointment with Dr. Azarbal. He will perform the appropriate tests for accurate diagnosis and treatment that will help you get the sleep you need.